The start off will be from the Grand Harbour, Valletta at 1030 hrs. Boats may also join in and follow the lead boat all the way to St Paul's Bay in accordance with the Regulations mentioned below. The end course of this cruise will be in the area off Bugibba square inlet. A Notice to Mariners will be issued in due course and this, together with our event programme can be downloaded from here. 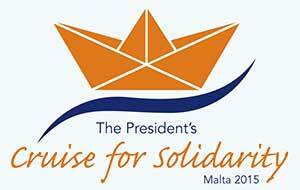 Her Excellency Marie-Louise Coleiro Preca, President of Malta will be on the leading boat. The formation will be coordinated by the Armed Forces of Malta. Participating vessels have to be registered and / or licensed in accordance with applicable legislation on the day of this event. Skippers have to be licensed / qualified in accordance with applicable legislation. Each skipper is fully responsible for his / her boat and is to observe current health / safety regulations and any notices / directives issued by the Organisers and / or other relevant Authorities. Each skipper is to ensure that the maximum allowable number of persons allowed on board is not to be exceeded. No exceptions will be made. Children under 12 years in open boats are to wear lifejackets at all times. The transit speed from start to finish will be around 5 to 6 knots. Vessels are at no time allowed to overtake the lead boat, are to follow the route as indicated in the attached chart and are to follow any instructions given by the lead boat, enforcement Agencies or marshalling boats. Sailing vessels may use an outer route if wind direction is favorable to proceed under sail. Skippers are to ensure that the vessel is equipped with the necessary fire fighting and life saving appliances and that the vessel is navigated safely at all times. The skipper / owner is to register by completing the application form provided by the Organisers. Each vessel is to clearly display the flag as supplied by the Organisers upon registration. All registered persons are to wear the cap supplied upon registering for the event. VHF Channel 67 will be the working channel for the event. In the case of interference the Organisers may give an alternative working channel just before the tart of the event. The working channel is not to be used for other unnecessary purpose. In case of emergency established procedures are to be followed by each skipper involved. The Organisers are not responsible for any 3rd party damage or injuries and participants take part at their own risk and each skipper is fully responsible for the safe operation of his / her vessel. These Rules are without prejudice to the International Regulations for Preventing Collisions at Sea (COLREGS) and any other applicable legislation.